You know how it goes…you go looking for a screw driver and end up painting a room? Well, in this case, I fixed the broken dryer belt, Thank you very much!, and ended up doing a complete makeover of the room.. Lying under the dryer, I became disgusted with what had become of an already pretty pathetic room. The Laundry Room truly was just a dumping ground for dirty clothes. 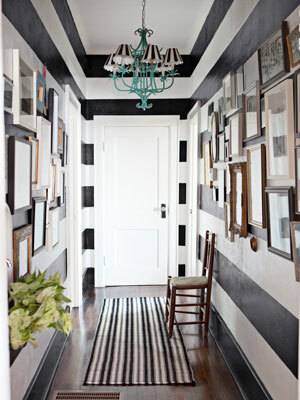 But then the March Issue of Country Living came along with the cover story about Stray Dog Designs founders Jane and Billy Pritchard and I was mesmerized by their hallway with the horizontal stripes. I knew that I could not pull off our 10 x 30 upstairs hall but I could do our teeny laundry room. And so I did!!! Prior to my laundry room makeover, it was the room I could not get out of fast enough. PRO: It has a window, and a door for that matter that goes to the back porch. I has high ceilings and built in shelves. so it can feel a bit like a clog in a drain when the laundry piles up. The end result….you tell me!!! I want to move into my laundry room!!! go into your kitchen, and open your trash can and look in. I will nor go so far as to say that I LOVE Doing the laundry…but I will say, that it is way more pleasant and I am always happy when I see my Stripes!!! Ha! These are not my initials, I got this (and about 10 more for gifts) monogramed tote at the llbean outlet! $7.99!!! Can;t beat that! Love the long straps! Looks fantastic!! I would totally move in there… even if it meant doing more laundry 🙂 Nice job! I love your laundry room. The blue doors clinch the deal. Too funny about the tote bag! Gorgeous high ceilings. love love love! and i totally relate to going to fix or do one thing and that leading to a bigger project. I love my monograms that aren’t mine. 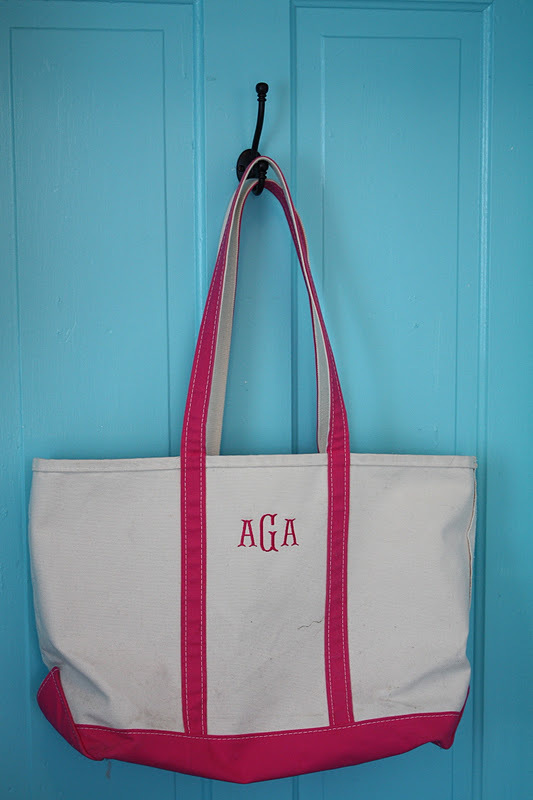 I have a few LLbean totes I got for a song as well…..I like to make up other names and alter egos for them. So fun. Lesli, your laundry room is fabulous! I am so jealous you’re living in a 130 year old farmhouse in the south. 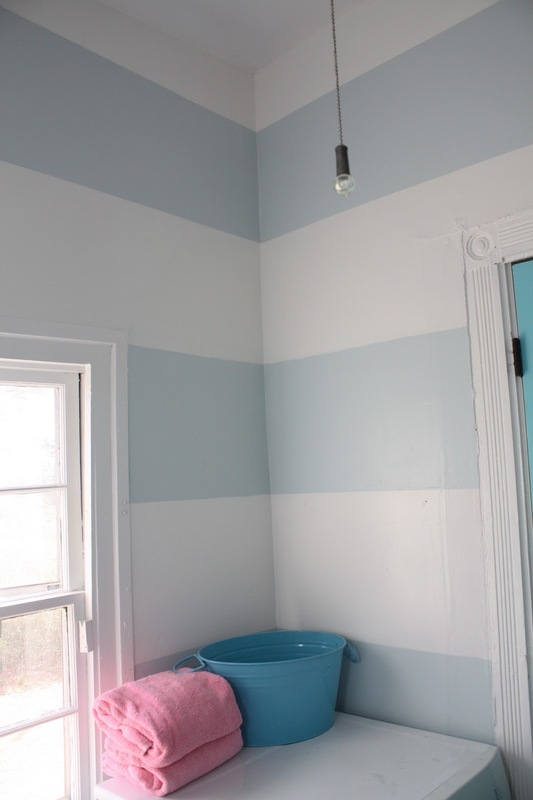 I just found your blog through the Roomspiration party and I am excited to read more, but first I have to tell you I LOVE your striped laundry room…so cute. Not sure what I love more, the laundry room…..or the LL Bean bag that’s NOT your monogram 🙂 SO awesome! 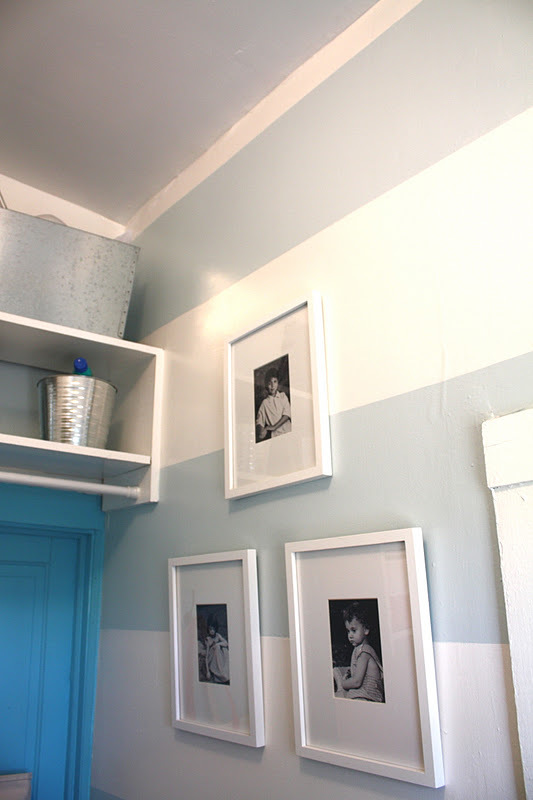 The blue/white combo is gorgeous and I love the framed photos too! I love the stripes! So clean and fresh. I’m wondering if you painted the both sides of the door or just the inside of it. In other words is the Fairy Tale Blue only visible from the inside of the laundry room or can you see it from the kitchen too? Thanks… Love your home and you animal paintings! 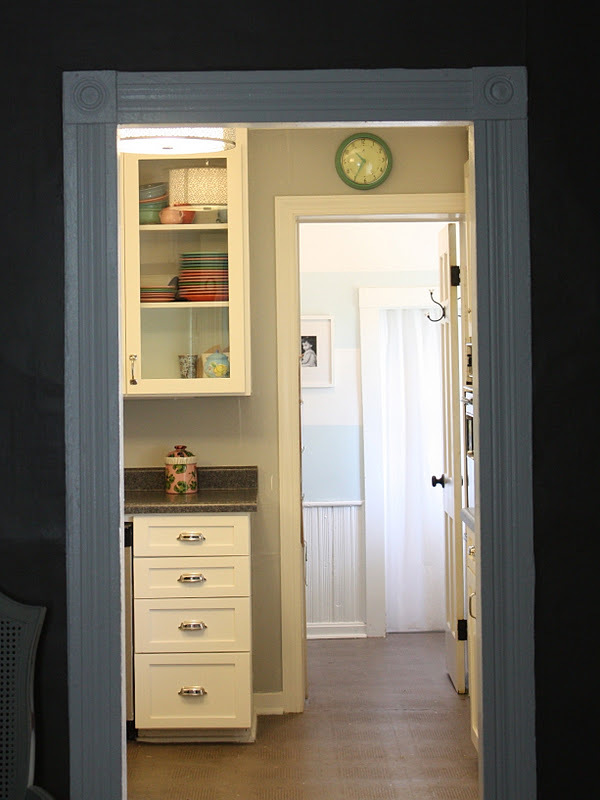 The laundry room door is painted Fairy tale Blue on the Laundry room side and Mountain Peak White on the kitchen side….thanks!!! Thanks so much for responding. I think I may do the same type of thing with my laundry door. Previous Post 31 Days, well minus 3, of CHANGE- Learning to NeedlePoint – a Metaphor for…something? 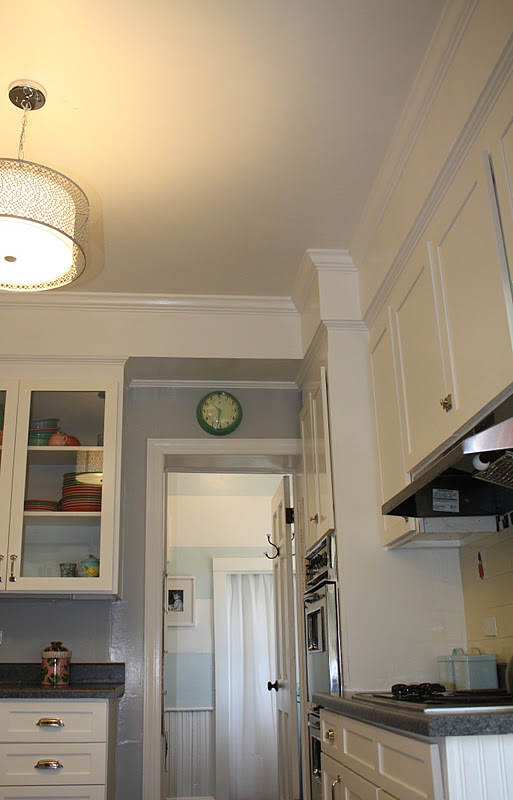 Next Post TGI FRIDAY Makeover Wrap Up- A DRESSER/Cabinet RETROSPECTIVE!!! !